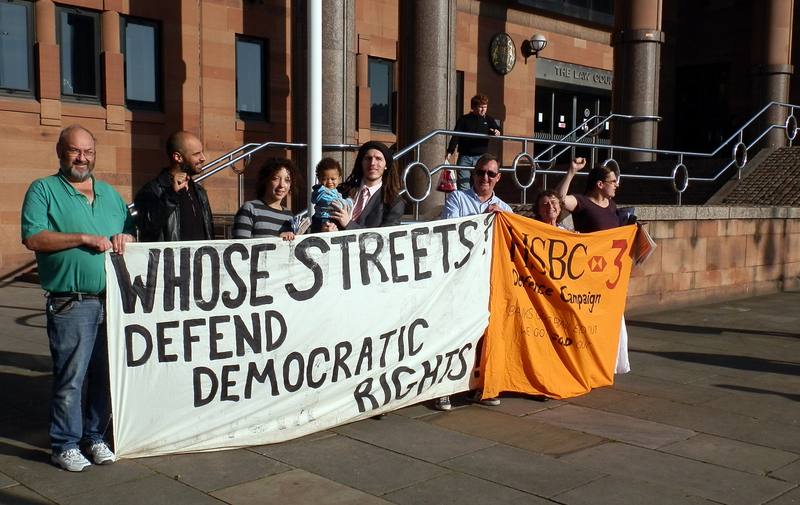 Glasgow Defence Campaign: Victory for Democratic Rights as HSBC 3 Exonerated! Victory for Democratic Rights as HSBC 3 Exonerated! Posted below is the victory statement of the HSBC 3 Defence Campaign in Newcastle where political charges and convictions against three Fight Racism! Fight Imperialism! supporters have been successfully overturned. The Glasgow Defence Campaign would like to send them our solidarity and applaud their consistent work against the cuts and the attack on democratic rights which has led to this victory against political policing! They did not win justice by sitting on their hands! Join Court protests in Glasgow! The convictions of Mark Pearson and Patrick Reay – who were arrested for protesting against public sector cuts and tax dodging banks and companies in December 2010 – were overturned yesterday after a two day appeal at Newcastle Crown Court. The success of the appeal is a victory for the democratic right to protest in Newcastle and shows that it is always worthwhile challenging political policing. The arrests and charges of the HSBC 3 were politically motivated, designed to intimidate protesters, and restrict future protests against the cuts and austerity measures. As John Pilger said in his solidarity statement, ‘The arrests of Patrick, Mark and Toby starkly represent the most disturbing trend in Britain — the rise of an openly political police… At worst, the police can kill with impunity, it seems, and increasingly they arrest and prosecute arbitrarily those whose dissent which marks the line between democracy and a state of fear and compliance’. In recent years many activists have been arrested on trumped-up charges, including the Gaza solidarity demonstrations in early 2009, the student protests in December 2010/ January 2011 and the August 2011 uprisings. Many people were encouraged by duty solicitors to plead guilty or accept a caution, on the basis that they would avoid a criminal record or receive a reduced sentence. This may seem like a better option in the short term but it erodes political rights for all of us, allowing protest to be criminalised. Defend One, Defend All, Defend the HSBC 3! The HSBC 3 Defence Campaign has shown that it is possible to fight charges on a political basis, thereby defending both individual activists and future demonstrators. The HSBC 3 refused to accept any guilt for their legitimate actions as protesters. Even after Mark and Patrick were unfairly convicted at the magistrate’s court and fined a total of £760, they were able to appeal the convictions because of the support of the campaign. Many thanks to all those people who supported the HSBC 3 defence campaign. In particular the court witnesses, Fight Racism! Fight Imperialism! / Revolutionary Communist Group who organised demonstrations and court pickets, members of the North East Anarchists Group and the Anti-Cuts Network who organised several benefit gigs, everybody who took part in those events or helped publicise them, Unite Newcastle Central Branch who made a financial contribution, and the many people who showed their solidarity from the court’s public gallery during the trial. The HSBC 3 Defence Campaign has always been clear on the need for political action on the streets alongside a legal defence in the courts. As with the police, the fundamental role of Britain’s courts is the defence of private property – they cannot be trusted to defend working class people. The defence of democratic rights is the defence of working class living standards. As the fight against austerity continues, we need to be ready for more defence campaigns. The example of the HSBC 3 Defence Campaign should be celebrated and followed.